Let us know what you think of your online course, leave us a review ! How am I assessed and certified for this candidate mandatory training course? At the end of this candidate mandatory e-learning course, learners will be required to complete an online assessment. On successful completion of the knowledge test (80% pass mark), learners will be able to download a FREE CPD certificate that is valid for one year. 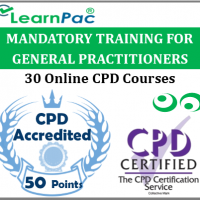 The content of this online mandatory training course has been independently certified as conforming to universally accepted Continuous Professional Development (CPD) guidelines. What is covered in this online candidate mandatory training course? These e-learning courses cover the main points relating to the Skills for Health CSTF learning outcomes and CQC recommendations. They have additional online learning resources that provide more details for learners to refer to during the course and in practice. 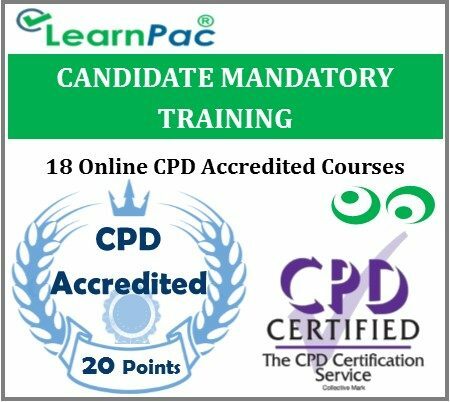 LearnPac Systems’ online candidate mandatory training course package was developed in line with the CSTF learning outcomes. LearnPac Systems’ online mandatory courses should be completed by all healthcare and social care staff. This includes voluntary staff and unpaid working in NHS and private hospitals. Locum doctors, locum allied health professionals, agency nurses and healthcare assistants can also complete these e learning courses. These online candidate mandatory training courses are also relevant for health and social care support workers, including those who work for nursing care homes, residential care homes and charities. 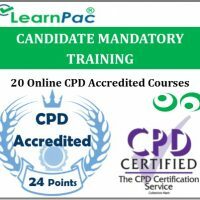 Why choose LearnPac Systems’ candidate mandatory traininge-learning courses?